First, to see pictures of the rooms, please go to the vistana website. Google THE WESTIN KĀ‘ANAPALI OCEAN RESORT VILLAS NORTH. Then look up TWO-BEDROOM LOCKOUT VILLA. They have tons of photos, better than we can take. This area is paradise. There are all the activities you could ask for. One day sit by the pool. Next day walk out another 250 feet and sit on the beach and snorkel the reef with an occasional turtle and schools of tropical fish. Ready for some action? Hike or bike a volcano or visit a nature park. Next day go surfing or take a lesson. 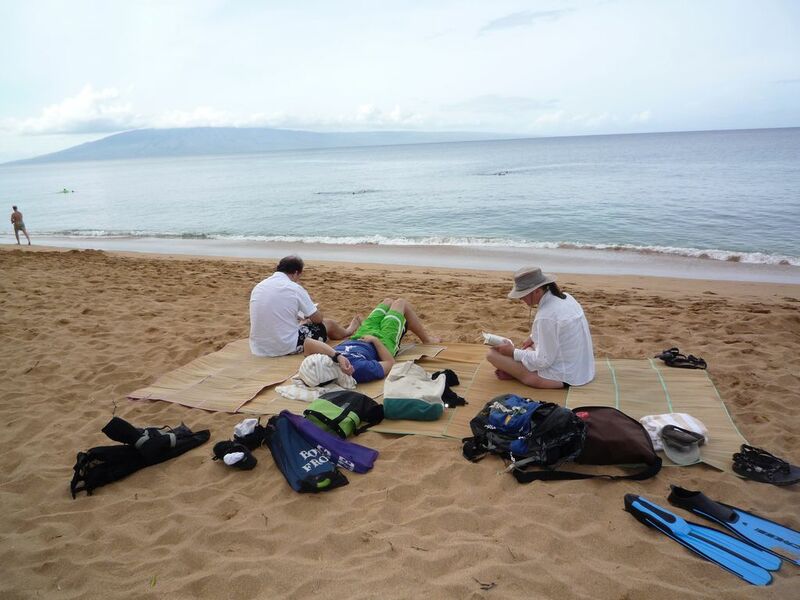 Go scuba diving or learn to dive right at the hotel and then go dive at Black Rock. Next day walk through downtown Lahina through the art galleries. (Friday night is gallery night in Lahaina – wine and muchies in the galleries and sometimes an artist demonstration) Go shopping. Watch the crafters on the street carve totems. Buy a tee shirt that you will wear until it dissolves. Buy one with sophomoric humor that you will never wear. Visit the Surfing Goat Dairy. Go to Haleakala or the try the only Pineapple Wine at Tedeschi Vineyards. Take the drive to Hana (once). If you think you are young, jump off some waterfalls into deep pools. The whales come in around December. Go see them on a boat or even from shore. You might see dolphins and flying fish too. Go sailing or deep-sea fishing. Take a ferry to one of the other islands for a day. And eat out every night at a great place, or save a few dollars and grill everything: fish or steak or even Costco pizzas. This is the USA, you don't have to worry about the water or the food. You might get rained on by a late afternoon shower. You will see a rainbow or two or three. Read about the weather on the US east coast and laugh at your friends. Free shuttle service to Whaler's Village area and Lahaina. The Westin is a walkable mile or so to Whaler’s village; this gives access to all the activities either by walking if you like to walk or by the shuttle to the Westin Hotel right next the village but at the same time gives you a quieter more private venue at which to relax. The resort is first class, fitness center and spa on site. Maid service is mid week. So go down and hoist a Mai Tai or a Lava Flow. Life is good. We are a family living in California who have, over the years, assembled a number of premium timeshare units for the best weeks in the best locations. We travel a lot and at times are not able to occupy all the timeshare units that we have bought. Buy trip insurance. NO REFUNDS.